Pink Weigela Bush is most often found in gardens and landscape designs because of its stunning pink flowers and dark purplish foliage. It is a simple and worthy addition to any landscape or flowerbed. The shrub is often used as a border along the edges of flower beds, near walkways and against structures. Its flowers grow in clusters on spray-like branches. The plant's blooms are vibrant shades of rosy pink that add color and interest to any garden. The blossoms are plentiful during the spring season and flower more sporadically during the summer months. The shrub grows well in the shade, but the blooms thrive in abundant sunshine and stay pretty longer. During the peak flowering season, the plant can have so many blossoms it is impossible to see the foliage underneath. Pink Weigela Bush, a member of the honeysuckle family, has many advantages for cultivators, which makes it an ideal shrub in landscape designs. It's a tough and hardy plant and adapts well to varying climates and growing conditions. Also, the shrub doesn't require a lot of time and care.Pink Weigela is one of the most stunning ornamental bushes when in full bloom. They all shoot out large clusters of pink flowers that can make a remarkable feature or hedge element in any landscaping project. Your specific growth needs will depend on the particular cultivar you choose. Larger varietals will require more room to grow when you place them, as some can spread up to ten feet if left to grow. Clay to silty soils are preferable, but they can be fortunate in composted or bedding soil, so long as it is moist and well-drained.They love full sun, but they can take a little partial shade during the day. The more sun it has, though, the more impressive its blooms will be. 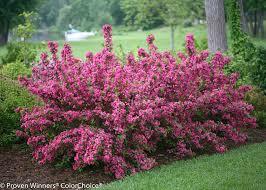 It works well with others, so it can be mixed in with different flowering shrubs to provide seasonal contrast. They should be fertilized once every year with a balanced plant food in late winter to offer full blooms in spring. Weigela will bloom from April through June.Maintenance is relatively simple with Weigela. Younger bushes do not require much in the way of trimming, other than for shape. As they mature, they will need some pruning in late winter to make room for new growth. That new growth is where a lot of blossoms will happen, so pruning and feeding before the bush greens in spring is key to getting the most out of its spectacular there are no significant insect or disease issues with Weigela, another reason it is easy to maintain. The wide varieties and versatility of this particular bush make it extremely useful in many aspects of landscaping and horticulture. It is also known to attract hummingbirds.